You Can Do It… Yourself! When it comes to building your own backyard oasis, we at Buck’s Landscape Materials and Pond Shop believe in you. 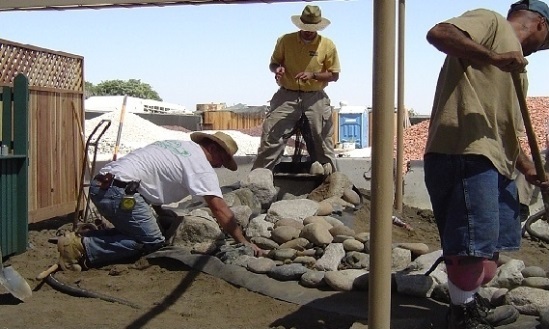 We think you have what it takes to create your own beautiful water feature like one of the pros. In fact 75% of those who have purchased a pondkit from us in the last 10 years have been homeowners just like you. The biggest misconception about building a pond is that it is too technical, or too time consuming, and must be done by a landscape contractor. But that’s not the case at all. With the right materials, and a little bit of help from your local pond pros at Buck’s, you can be on your way to becoming an official “do-it-yourselfer”. The biggest decision for most home-owners, when considering building a pond themselves, is which is of more value to them. Is it time or money? Those who have very little time to take on a project of this size might find it much easier to pay a contractor to install a water feature for them. On the other hand, the homeowner with a budget and a free weekend might find the perfect opportunity to get a little dirty. Paying a professional isn’t a bad thing, but know that you can save a little money by becoming the pro yourself. The one thing that seperates a professional pond builder from the average home-owner is knowledge and experience. That is where we come in. Buck’s offers free pond-building seminars 2-3 times a year just for you. From start to finish we install one of our all inclusive pond kits in just under 4 hours. Our seminars are packed full of information and opportunities to get a hands-on experience at installing a beautiful water feature. Pay us a visit to find out when the next one is. We have been building and designing ponds and water features since 2004. The experience we have gained over the years is available to you and just a phone call away. Considering a water feature in your yard? Looking for ideas or just want to get some prices? Come in and check out what we have to offer. We believe you CAN do it yourself.